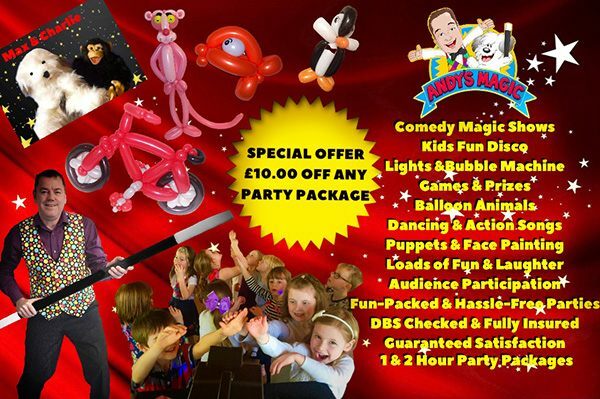 Whether its children's entertainment for a reward day, end of term party or a Christmas party for kids at your school magician and children's entertainer Andy's magic is ideal for children of all ages. Andy supplies a fantastic magic show full of audience particiapation, interactivity, amazing magic and loads fun. Andy will have the kids in fits of laughter and then gasping with amazement and applauding wildly from start to finish. The children / kids and teachers are guranteed to love it. The show is structured and aimed at children between 5 -11 year olds and never fails to get rebooked. This is a fun filled disco party that ibcludes LED and laser disco lights and a great bubble machine the kids go crazy for. With up-to-date music, great action-packed games, super prizes and giveaways, dancing, action songs this school disco / party will be non-stop from start to finish. Book Andy for your school party entertainment in Birmingham, Wolverhampton, Worcester, Bromsgrove, Solihull and Stourbridge and you're guaranteed to be in great hands with Andy's Magic the children's entertainer and magician that schools love to recommend... go HERE to see what they say about Andy's Magic shows and entertainments. Aimed at the 2 -5 ages, the entertainment and magic shows here are designed specifically with the "littles ones" in mind. The magic is woven into great, fun stories that will spellbind the children. Max the Magic Dog, Andy's crazy but adorable puppet makes his appeanace, causes absolute mayhem and finally produces sweets for all the children... by MAGIC! Fun and laughter throughout the show and balloon animals can be supplied to all the children at the end too. "Thanks for a brilliant day with all the fun-packed entertainment that children in schools love and enjoy. They all want to do it again next term. You were just brilliant Andy. Thanks." - Kully, Woodfield Primary School, Wolverhampton.